Compatible with DYMO LabelWriter 450 series, the time expiring visitor badge helps enhance on-site safety and security by monitoring guests. A Red stop sign appears in the corner of the visitor badge when visit time is up. Use the LabelWriter to print a custom Name tag for each visitor on the 2.25-Inch by 4-inch White Name tags. DYMOamp;reg; - Visitor Management Time-Expiring Name Badges, Adhesive, 2-1/4 x 4, 250/Box - Sold As 1 Box - Advanced security for your event. Rely on advanced security for your event with 12-hour, time-expiring name badges. A red stop sign appears on the badge when time has expired. Great for visitor management and trade show admissions. 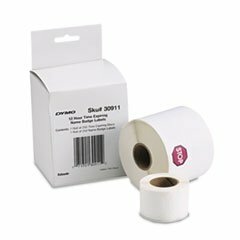 Label Size - text: 2 1/4 x 4 Label Colors: White Machine Compatibility: PC Label Printers Printed Text Colors: Black. Rely on advanced security for your event with 12-hour, time-expiring name badges. A red stop sign appears on the badge when time has expired. Great for visitor management and trade show admissions. 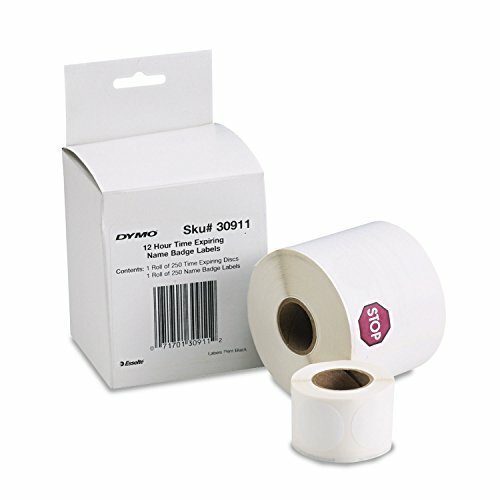 Label Size - text: 2 1/4 x 4; Label Color(s): White; Machine Compatibility: PC Label Printers; Printed Text Color(s): Black. ID Supplies; From Name Tags To Expiring Time Badges, Here's A Look.